Packaging ranges from syringes and small cans. Metal powder producer Höganäs has introduced a magnum cartridge for customers requiring a high volume paste. This new magnum cartridge is available for automated dispensing, printing, and roller coating of brazing pastes. 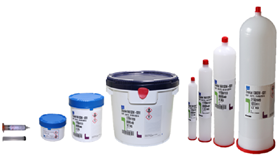 Packaging ranges from syringes and small cans, used for deliveries of samples, to bigger cans and buckets that cover larger volume and demand. In addition to these, the company also provides different sizes of cartridges that can help ensure a clean handling of the paste. Depending on the type of brazing paste, our new magnum cartridge will accommodate 8-12kg of paste.